Monroe 10u Tournament team Wins the 4th Annual Monroe Baseball Bash! 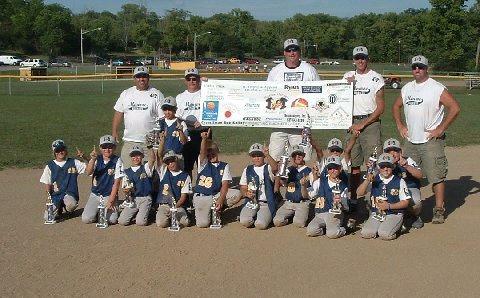 The 10u Monroe Hornets took first place in the 4th Annual Monroe Baseball Bash this past weekend! It was the third time in the past four weeks that the Hornets had made it to the championship game and their first time taking home the first place trophy. The Hornets won their first game Saturday morning beating Miamisburg 7-2. Next up was Harrison who advanced to play the Hornets by beating Brookville Friday night. The Hornets played well and won the game 7-1. The Hornets then advanced to play Valley View in a rematch of two teams that met in the previous tournament in which Valley View was victorious. The Hornets again proved to be too much for their opponents, winning the game 11-3. This put the Hornets in the Championship by way of the winners bracket for the first time. Coming into the Championship game the Hornets had gone through their pitching rotation only once, using six pitchers for three innings each. This was a luxury for the Hornet team who in two previous tournaments had made it to the championship game by way of the losers bracket with a tired rotation. The Spartans jumped out to an early 2-0 lead in the first inning and each team scored one run in the second inning putting Valley View ahead by the score of 3-1. The Spartans scored once again in the third and fourth inning going ahead of the Hornets 5-1. The Hornet fans started to wonder if the team would bounce back, at this point it looked like a second game would be needed to decide the championship. The hive came alive in the fifth and sixth inning scoring two times in each frame tying the game 5-5 and forcing an extra inning. One inning was all the Host team needed scoring on a steal of home off an errant throw from the Spartan catcher to the mound. As the runner crossed the plate the Hive was buzzing loud and proud!